Kinsella on Liberty Podcast, Episode 045. This is lecture 1 (of 6) of my 2011 Mises Academy course “Libertarian Controversies.” This lecture contained an overview of basic austro-libertarian concepts and started discussing various libertarian “misconceptions,” regarding the left-right spectrum, coercion and force vs. aggression, the jurisdiction of private defense agencies, and related issues. I’ll release the remaining lectures here in the podcast feed in upcoming days. This course followed on my speech “Correcting some Common Libertarian Misconceptions,” from the 2011 Annual Meeting of the Property and Freedom Society (May 27-29, 2011; see KOL 044 | “Correcting some Common Libertarian Misconceptions” (PFS 2011)). That talk engendered a good deal of discussion and interest, but in the time allotted for a single speech I was able to cover only a small number of the topics I had assembled over the years. In the 6 week Mises Academy course, “Libertarian Controversies” (Sept. 19-Oct. 23, 2011), I covered these and related topics in greater depth. The course was planned for 5 weeks initially, but I added a sixth “bonus” lecture at student request. 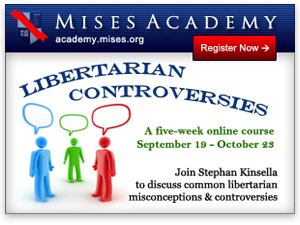 The course is discussed in my Mises Daily article “Libertarian Controversies” (Aug. 25, 2011); here are the audio and slides for all six lectures. The “suggested readings” for this lecture are appended below.